‘Tis the season and, at last, our summer is complete. The Corn Man, Jim Cadnum, has arrived. Our anticipation is so great that, though he seemed late this year, he was pretty much right on schedule. For the next few weeks we’ll line up for a few ears or a few dozen ears. Waiting in the line is enlightening as fellow loyal corn enthusiasts share family recipes and tips (scrape the largest kernels off the cob first). Corn is one of the early crops known, and we owe thanks to our continent’s Mexican neighbors for this diverse staple that is found in myriad products in our pantry: corn meal, corn flakes, hominy, grits and even alcohol. We’ve come to depend on many of these products (especially folks with gluten-free diets), but nothing can compare to biting into an ear of golden sweet corn, slathered with butter and seasoned simply with salt and pepper. Jim has been peddling his corn at the Sandpoint Farmers’ Market since 1995 and sells around 200 dozen ears each week. Now that’s a lot of corn! He speaks of his corn seed varieties with knowledge (and affection) and rattles off gestation dates like a proud expectant father. Renaissance—an early variety—was planted first, followed by five plantings of Montauk. These carefully selected seeds and planting dates will ensure sweet corn to last the entire season. Every Friday, in preparation for Saturday’s market, he spends nearly eight hours picking the ears himself and filling those iconic burlap bags. With the addition of Jim’s new two-row corn planter, I expect we’ll see him at the market for many years to come. How to prepare an ear of corn can sure stir up a lot of expert advice. Some swear by tossing a pinch of sugar, a dash of lemon juice or even a few drops of milk to the water before adding the corn. Cooking times vary from 3 to 10 minutes. My favorite corn on the cob directions come from the Jim the Corn Man and his trusty sidekick, Bob the Bag Man. I feel like if anyone knows their way around an ear of corn, it’s those two. Jim brings a pot of water to a boil, drops in the corn and when it comes back to a boil, he cooks it for three minutes. Nothing in the water except corn, and no pretentiousness to his formula. Plain water, because why would you put sugar in the water when the corn is already sweet? Salt? Well, along with butter, it belongs on the corn, not in the water. Bob simply butters up an ear of corn, wraps it in waxed paper and cooks it for three minutes in the microwave. From my not-so-scientific survey in the corn line last Saturday, I learned the most popular recipe featuring corn as a key ingredient is chowder. Amidst chefs and home cooks, everyone had an opinion and no one held back on the merits of bacon or no bacon, whether or not to pre-cook the corn, and voicing their thickening choices that included cream, corn starch, or pureeing some of the soup then adding back into the pot as a thickener. For nearly 400 years, corn has been a New American staple. And waiting in that line, we all agreed upon the comfort and familiarity it brings to our tables. Nearly 40 years ago, far, far from home, a simple corn soup brought me much comfort. On the first morning of a long anticipated journey to Bogotá, Colombia, I was in a busy café. Using my best (C-) high school Spanish, I ordered a glass of orange juice. Can you imagine my surprise when a ham and cheese omelet appeared before me? Knowing I was in over my head, I acknowledged the plate with a gracious nod to the server and quietly proceeded to eat it. The rest of the day, and the next, didn’t turn out much better. While the mountains and countryside were spectacular, the exotic foods delicious and my hosts ever so gracious, I was frustrated with the language barrier and my inability to form the deep connections I had dreamed about. A few days into the trip, while strolling the Plaza Bolivar, we stopped for lunch at La Puerta Falsa, a local landmark. My friend, Jaime, ordered Ajiaco, the national soup of Colombia, for our small group. A family-sized steaming bowl, filled with a rich chicken broth, cubes of potatoes, disks of corn on the cob and slices of warm, buttery avocado was placed on the table. The familiar foods looked so appealing, like a little bit of home, and along with free flowing red wine, it was the most delicious meal and companionship I experienced on that first of many trips to South America. Even today, a simple ear of corn can evoke memories of that young girl in a faraway land. 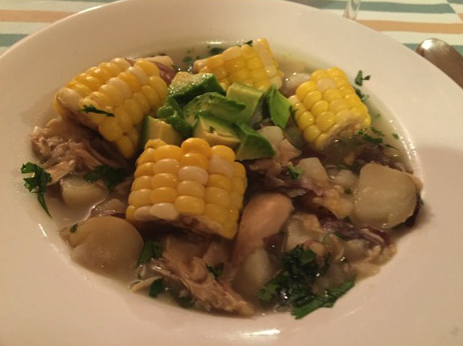 You don’t have to go South America to experience Ajiaco, but you do need some good corn to try out my recipe. So head on down to the Market and get there early. Last week’s corn was gone well before noon. It’s a friendly wait, and, along with your corn, you may pick up another new recipe or two. •Pat chicken dry and season with ¾ teaspoon salt and ½ teaspoon pepper. •Heat butter in a wide, heavy dutch oven or pot over moderately high heat, brown chicken in 2 batches, skin side down first, turning occasionally, about 10 minutes. Transfer chicken as browned to a plate. •Add the onion, oregano and 1 teaspoon each salt and pepper, and saute, stirring, until light golden, about 5 minutes. Coarsely grate the baking potatoes with a box grater and add to the pot. Add back the chicken, broth, and water, covered, stirring occasionally, until chicken is cooked through, about 25 minutes. •Transfer chicken with tongs to a cutting board to cool. Add the cubed new potatoes to pot. Simmer, covered, stirring occasionally, until cubed potatoes are almost tender, about 10 minutes. Add corn and simmer, covered, until tender, 5 to 10 minutes more. •While corn is cooking, remove skin and bones from chicken and coarsely shred meat. Add meat to pot and heat through.